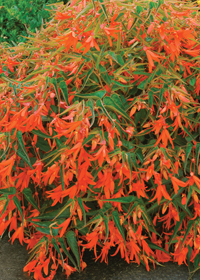 A stunning profusion of bright orange-red pendulous blooms! Bonfire Begonias can tolerate a wide variety of conditions. Low maintenance and easy-care. Grow in full or partial sun.